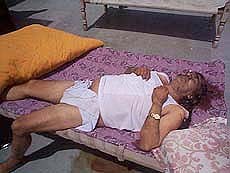 The body of Mr Relu Ram Poonia lying on a cot on the roof of his palatial mansion at Litani village, near Hisar. In a bizarre incident, the 20-year-old daughter of a former Legislator, Mr Relu Ram Poonia allegedly killed her father and seven other members of the family at their farmhouse at Litani village near here late last night before consuming some insecticide. She has been admitted to a hospital at Barwala, 30 km from here, and is stated to be out of danger. The dead included Mr Poonia (50), his second wife Krishna (41), son Sunil, daughter-in-law Shakuntala, grandson Lokesh, granddaughters Shivani and Preeti and daughter Priyanka. The daughter who is alleged to have clubbed them to death in their sleep has been identified as Sonia (20). She is married. She left behind a note saying she had finished her whole family. No reasons were given in the note. Sonia Poonia’s daughter from his second wife, told reporters in the presence of SDM Balraj Singh that she murdered six of her family members, incensed after she was insulted by her brother after a birthday dinner. She claimed to have used a heavy steel rod to batter her sleeping family to death. “My step-brother Sunil was not on good terms with me and my husband Sanjeev. My father, in connivance with him, conspired to break my marriage and dispossess us from the property,’’ Sonia said. “My mother invited us yesterday for my sister Priyanka’s birthday. My husband came with me up to Hisar and returned after dropping me there. Sunil, who did not join the party in the evening, uttered harsh words later. I was hurt by it and used the rod to kill Sunil, his wife Shakuntla, his children Lokesh (4) Shivani (2) and Preeti (3 months)’’, Sonia told the police during the preliminary inquiry. According to the police the deaths were noticed around 7 a.m. when a school van came to pick up Lokesh. The manager of the farmhouse sent a servant upstairs to bring Lokesh. The servant found all of them dead. Sonia was found gasping for breath in a bedroom. The manager and the servants told the police that Sonia had brought her sister Priyanka from her hostel here to celebrate her birthday at the farmhouse. The celebrations went on till past midnight when the servants heard firing of crackers. Thereafter, Sonia came to the garage below and took away an iron rod from there. None of them heard any cries for help or other commotion. The police said the bodies were found in different rooms on the first and second floors of the palatial mansion. All of them had been clubbed to death. There were no signs of resistance. However, the hands of Mr Poonia’s daughter-in-law Shakuntala were found tied. She had also been gagged. Several ‘thalis’ were found there with leftovers of ‘kheer’. One of these inexplicably had 250 gms of opium. The police suspect that the ‘kheer’ might have been laced with opium. The servants told the police that around 4.45 a.m. Sonia drove away to the Surewala Chowk near the farmhouse in a Tata Sumo and returned a few minutes later. It is suspected that she might have dropped some of her accomplices there before returning home and consuming insecticide. There had been a longstanding property dispute between Sonia and Sunil (Mr Poonia’s son from his late first wife). While Sonia wanted her father to give her 46 acres of land around the farmhouse, Sunil refused saying he was cultivating it. The family also had valuable properties in several nearby villages, Delhi and Faridabad. It is learnt that she had a tiff with Sunil three days ago during which she whipped out a revolver and pointed it at Sunil. The matter was hushed up with Mr Poonia’s intervention. Relu Ram Poonia’s was a truly rags to riches story. Beginning his career as a lowly truck cleaner, he rose to be one of the richest men in Haryana brushing the law often as he traversed the arduous path. A street wise man, he was quick to learn that bitumen was being used to make spurious black oil which was sold to industrial units in Faridabad at an astonishing profit. Having learnt the trade secrets he went on head one of the biggest cartels in this underground industry. Having made his millions, he bought agricultural land in his native village Litani near here and built a huge mansion there. Having built his dream house he began donating hefty sums to village organisations which invited him as chief guest at their functions. This helped him acquire the status of a philanthropist of sorts. He started hobnobbing with the late Deputy Prime Minister Mr Devi Lal and Mr Om Prakash Chautala. He hoped to bag the INLD ticket from the Barwala Assembly segment in 1996 but that was not to be.